Bet Panthers (+6) & Jets (-3) & Browns (+9.5) & Rams (-625) at +734 with Karamba. The Panthers don’t play particularly well in Atlanta, as they’ve lost eight of their last 10 there. Many of the games haven’t been close as the Falcons have covered the spread in eight of those 10 meetings with the average margin of defeat being 12.0 points per game. However, this feels like a different situation. The Falcons are in the midst of all sorts of red-zone struggles, and while some might say not to extrapolate too much from one week, this is a trend that we saw with them last season. On top of that, they’ve just lost two key anchors on defense with safety Keanu Neal and linebacker Deion Jones. You can’t remove two Pro Bowlers off a defense and expect the same production. The Panthers are run heavy and that should open up some gaps for them. A win might be too much to ask here as the Falcons will be very focused to avoid an 0-2 hole, but a cover is a reasonable request. Take the Panthers +6 at Karamba. Both the Jets and Dolphins are coming off inspiring Week 1 wins, but the caliber of those wins is quite different. The Dolphins barely edged by the Tennessee Titans even though they were at home and the Titans lost their starting quarterback, left tackle and Pro Bowl tight end midgame. As for the Jets, they went on the road and smoked the Detroit Lions 48-17, looking great in all three phases of the game. Of course, the Jets aren’t going to look amazing like that every week but they’re the better team in this equation. They have the better defense and their defensive line – which pressured Matt Stafford all night in the opener – should have an easy time of things against a subpar Dolphins offensive line. Miami has a number of other areas to be concerned with as the offense had just 342 yards in Week 1 – 75 of which came on one play. Ryan Tannehill threw a couple of picks and the defense had no sacks. Road trips don’t always go so well for this squad, as they’ve lost five straight on the road and are 2-6-1 ATS in their last nine against the Jets. They’re also 0-5 SU and ATS in their last five on the road anywhere. We’ll look for those trends to continue as the Jets win and cover here. Take the Jets -3 at Karamba. The general opinion in this spot is going to be that the Saints bounce back in a big way and roll. However, history shows us that might not be so easy. Remember that the Saints have started 0-2 in each of the last four seasons and flopped in their opener at home to the Tampa Bay Buccaneers. Be careful assuming anything in this spot. Yes, they’re facing the Cleveland Browns but this is a different Browns team – one that comes in with some confidence. The biggest concern in this spot when laying 9.5 points is that the Saints had no pressure on Ryan Fitzpatrick last week and made him look like a league MVP. The Browns have some decent receivers and a quality running game that could move the chains, keep the clock rolling and play keep away. I’m not expecting the Browns to win this game outright, but I do think they can keep this within nine points or less. Take the Browns +9.5 at Karamba. For our fourth selection, we’re going to go with something that looks easy and hopefully turns out that way. The Rams are the biggest favorite on the board this week and for good reason. After a slow start on the road in Oakland, they ended up smoking the Raiders 33-13. Remember, the Rams didn’t play any of their starters in the preseason, so this was very much a ‘knock off the rust’ type of game. It took them a half but they got going after the break, outscoring the Raiders 23-0 in the final two quarters. On the flip side, you have the Cardinals who entered the year with some hope but looked totally lost in their opener. They lost 24-6 at home to the Washington Redskins and never had a chance. That’s a bad sign as now they have to go on the road and play a tougher opponent. It’s going to be a long year for the Cards. Take the Rams on the moneyline. Bet the Rams -815 at Karamba. 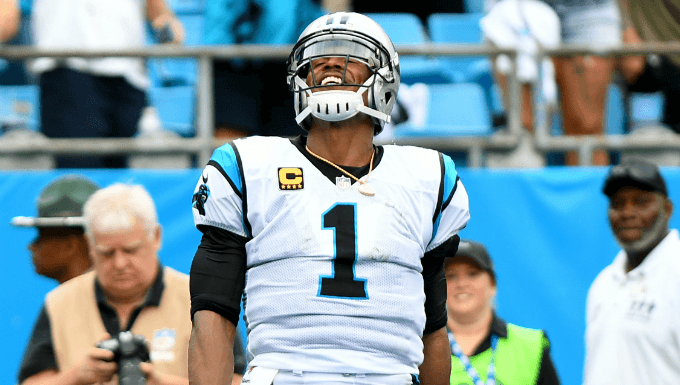 Play the four-team parlay of Panthers (+6) & Jets (-3) & Browns (+9.5) & Rams (-625) at +734 with Karamba.